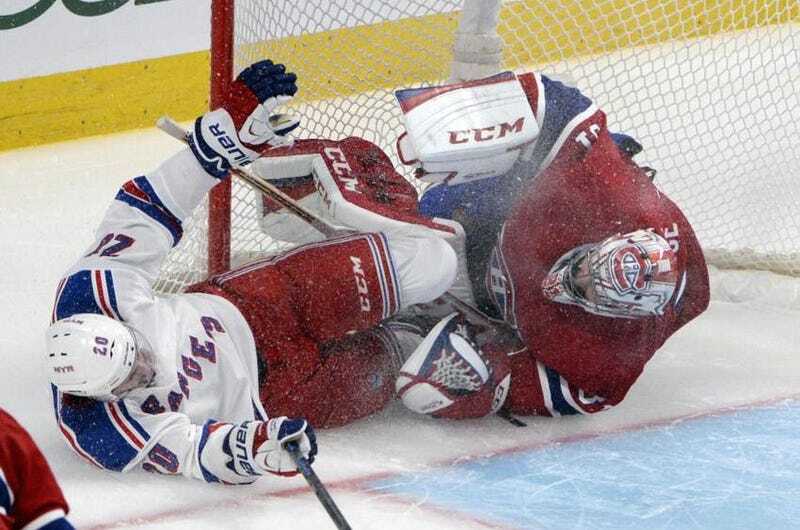 The Canadiens' chances of reaching their first Cup final since 1993 has suffered a major blow, after coach Michel Therrien announced that goalie Carey Price will miss at least the rest of the series with an injury suffered in a Game 1 collision with the Rangers' Chris Kreider. As you might expect, some of the Habs are not very happy. Here's the play, which appeared to injure Price's right knee. Price didn't come out for the third period of Saturday's game, and didn't appear at this morning's skate. But Therrien just made it official. "Carey Price won't be able to play," he said, "not only for tonight but for the rest of the series. "We've lost our best player." Price, who put up career bests in save percentage and GAA this season, and backstopped Canada to a gold medal at the Olympics, appeared finally set to shake the perception that he can't get it done in the playoffs. That leaves the Canadiens with two options. Peter Budaj, a decidedly average backup with decidedly horrid postseason numbers, and 24-year-old Dustin Tokarski, who has won the Memorial Cup and the Calder Cup, but only has a total of 10 NHL appearances. Montreal's Brandon Prust was initially the only Habs player to criticize Kreider for plowing over Price, saying "Whether it's on purpose or accidental, he ran him pretty hard. Everybody thinks it was accidental, but we call it accidentally on purpose...He did nothing to really avoid him. We're in the NHL. We know how to fall, how to not put our skates first when we fall." "Looking at the incident, it's a reckless play. That's the truth. And Kreider, that's not the first time he's going at goalies." He's referring to Kreider making contact with Marc-Andre Fleury in New York's series against Pittsburgh, though in that case, Kreider was shoved from behind by Kris Letang before losing his footing. Similar situation though: Kreider's very big and very, very fast, and in both instances found himself in on the goalie with the last defenseman riding him hard. Slowing to tee up a shot wasn't an option. But it's not clear why veering wide of the net wasn't one. "I had my head down trying to settle the puck," Kreider said Saturday. "I put it wide and somehow lost my footing. I thought maybe someone pressured me from behind. I seem to have an issue staying on my feet on those, but then I went in skates-first, and I just had too much momentum and couldn't really avoid him." Montreal has previously (and inexplicably) made the decision to rely on "toughness," so you wonder if there won't be some retribution tonight—or at least an attempt to counter the Rangers' speed with brutality. But with the Canadiens already having lost home-ice advantage in this series, and an untested goalie in net, you also wonder if they can afford to play rough.